Born July 31,1956 in Toronto, Canada, David Beecroft and his two brothers grew up in a home, where music has been a normal part of daily life. Under the influence of their father Bill Beecroft, a well known jazz musician (tenor and baritone saxophone, clarinet), the three children started early to learn their own instruments. David Beecroft’s older brother for example began playing the trombone and is now leading one of Toronto’s most successful GALA Orchestras as well as playing in many various Jazz groups around the city. 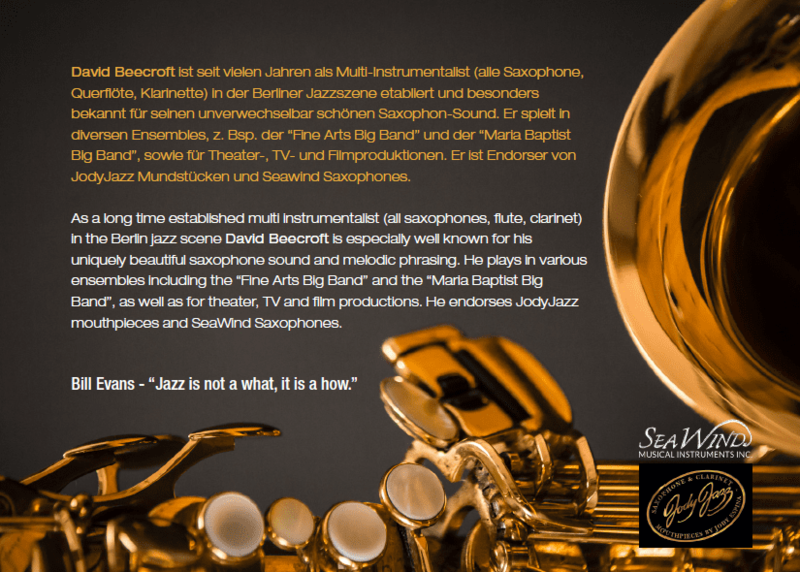 Being raised in that environment David Beecroft’s music career started at the age of 9, when he began taking piano lessons but already by the age of 12 he had fallen in love with the tenor saxophone, (his fathers horn), and decided to follow in his fathers footsteps. His early musical education consisted mostly of imitating the saxophone greats of his fathers record collection and listening to many of Toronto’s greatest players that regularly rehearsed in their home. Often he was allowed to hear his father playing on weekends in the local jazz clubs and later to allowed to “sit in” at his fathers jam sessions under the care of such Toronto jazz legends as Norm Amadio and Jim Galloway. As early as junior high school he was playing in a few neighborhood jazz groups. Because of this, his parents realized that he required a musically enriched education and so he was sent to a senior highschool that had an extensive music program. David Beecroft played in the school Big Band, concert band and founded his own sextet at the age of 17. 1974 he received the “Most Outstanding Player” award playing saxophone in in the highschool big band at a Canada wide Jazz competition. At this time he began to study flute to extend his musical possibilities. 1975 he secured his first steady engagement for over 1 year with his David Beecroft Quartet the Red Lion club in Toronto. In addition to that he played in many different jazz groups in Toronto and all across Canada. 1979 he was invited to Amsterdam, Holland, to play with very good local jazz musicians including Sandy Moss, (saxophone – Woody Herman big band), Erv Rocklin, (piano – Chet Baker, Lenny Bruce, Dexter Gordon), John Clayton, (bass – Count Basie, Monty Alexander), Wilbur Little, (bass – Elvin Jones, George Coleman), Adrie Braat, (bass – Dutch Swing College Band) In Amsterdam it was the first time he was recorded with famous musicians like John Clayton, Toots Thielmans and gave a memorial concert to Charlie Parker and a tribute to Ernie Wilkens for Dutch radio. 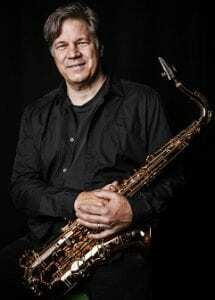 1981 David Beecroft returned to Toronto to play with the Bill Beecroft Dance Band (Gala Orchestra) and to continue his collaboration with Canadian jazz musicians. Three years later he began to play the soprano and alto saxophones which made it possible to play in more varied professional situations, including classical orchestras, theatre, musicals and shows. All of those musical influences helped him to enlarge his musical flexibility. 1991 invited to play at the Dumaurier International Jazz Festival and the Beaches International Jazz Festival. At this time he began composing his own music and playing it with his “David Beecroft Quartet”. 1991/94 joined the Norman Marshal Vileneuve Sextet and also worked with various players including Don Thompson, Bob Mover, Niel Swenson, Lorne Lofski, Moe Kaufman, Guido Basso, Rob McConnel, Pat LaBarbara, and others. 1992 he went to San Diego, California, to play with Chris Connor in his 7 piece jazz band 1994 he began playing with jazz vocalist Chris Bennett with whom he continues to play with until today. 1994 At this time he moved to Berlin and has since become one of the most well known jazz musicians in the city. 1995/99 he played as a guest soloist in the orchestra of the “Drei Groschen Oper” at the Deutches Theater. Since 1995 he has often been a guest of the Chameleon Cabaret as well as a substitute player with the RIAS orchestra (ZDF). He has played in all the big jazz clubs in Berlin like the A-Train, Schlot, Quasimodo, French Quarter, Badisher Hof etc. and for special concerts in churches or at the “Lapidarium”, or in museums and galleries. Since 1998 has been playing and touring for Jazz Radio Berlin. Recent tours include playing for MCM at the Mode-Messe in Dusseldorf and other big events through Germany. 2000 Began producing and engineering recordings for artists including Georgio Crobu, Ekkehard Wölk, Pepe Berns, Wolfgang Köhler, “Night Train” and many others. He has also began a project making documentary recordings of jazz musicians in Berlin in co-operation with Jazzagentur Berlin. 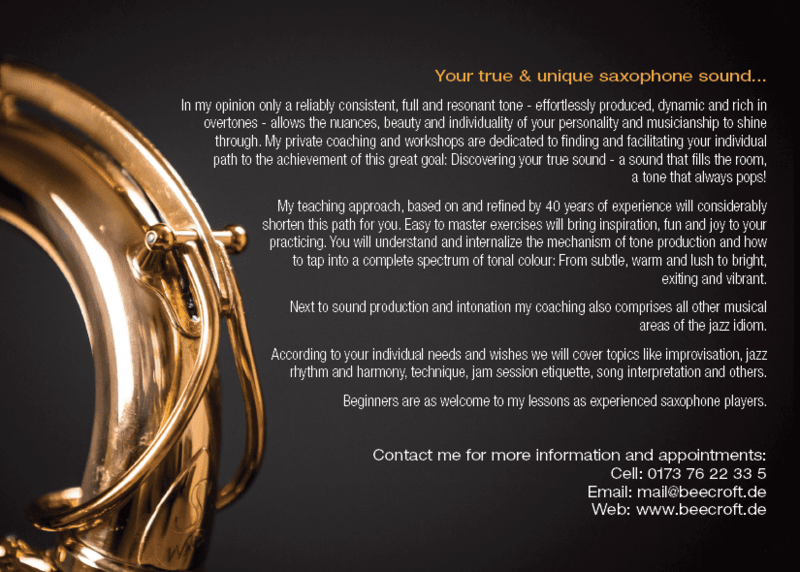 Completed his saxophone improvisation method book “Sound, Modality & Movement” which he currently uses for teaching at the Jazzschule Berlin. Co Leader of “Unsung Heroes”, “Jazz in the V.I.P. Lounge”, “Sax & Violins” & “Discover” with vocalist Gigi Andersson. 2003 Assumed the first alto saxophone chair in the Politzeiorchester Berlin. Formed the group “Le groupe des sept Canucks / The Group of Seven Canucks” for the purpose of representing Canada at cultural and social events across Germany. The group presents a fusion of Canadian Pop “hits” with a grooving, jazzy sensibility. Events include the official opening of the new Canadian Embassy on Potsdamer Platz. Started “Legere-Deutschland” to import and distribute Canadian made Légère synthetic saxophone & clarinet reeds. 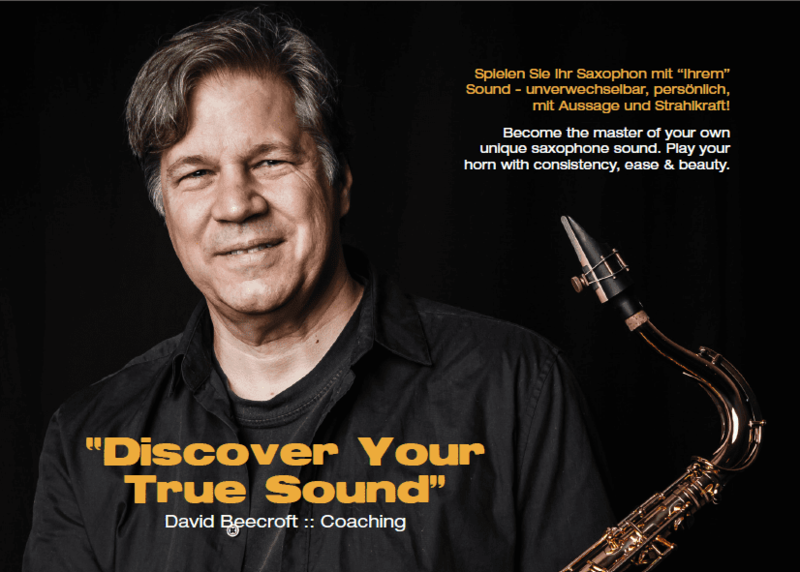 Improvisation Method, Play-Along books & CD’s as well as saxophone quartet / quintet music included in the Georg Bauer Verlag (Karlsruhe, Germany) music catalogue. Recorded and played music examples on “Jazz Basic” & “Jazz Advanced” Playbacks zum Improvisieren from Stefan Berker and “Groove it” – Tunesday Records. 2006 Began teaching at Musikschule Fanny Hensel in Berlin. Duties include teaching “one on one” as well as rehearsing the saxophone section for the school big band and occasionally taking the rehearsals for the whole band and directing “Sax O Fun” saxophone quintet. Produced jazz recordings for Prof. Wolfgang Köhler, Jiggs Whigham and Herb Gellar. Joined the Symphonic Pops Orchestra under the leadership of Frank Hollmann. Mr. Beecroft is a featured soloist on soprano and alto saxophones as well as playing clarinet. Formed the group “Strawberry and Devil Crab” with jazz singer Marianne Baer, Prof. Wolfgang Köhler – Piano, Paul Imm – Bass & Felix Astor – Drums. Completed Book & CD “Perfecting Intonation” which is presently available through Jazzwise publications, UK and various music outlets in Berlin, Germany. Became musical director/conductor of the “Fanny Hensel” Music school big band – “Foo Birds”, Berlin. 2010 Worked closely with Légère Reeds Ltd. Canada to develop the “Signature Series” saxophones reeds. Became an official endorser of Légère Signature Reeds. Concerts with new group: “That 2 Tenor Thang” with Bernhard Ullrich. Created the “Open Source Orchestra” – Conductor, Arranger, Soloist with co leader saxophonist Bernhard Ulrich. Played concerts every first Sunday evening of the month in Jazz Club Schlot for 1-1/2 years.